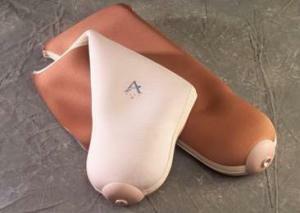 ALPS EZ Flex Prosthetic Liner maximizes user comfort and increases range of motion with its unique dual fabric combination. The EZF&rsquos anterior side allows patients to experience improved knee flexion with unlimited elasticity while the posterior fabric helps prevent bunching in the popliteal region with 80% less vertical stretch. Manufactured with ALPS EasyGel, the EZ Flex Locking Liner is comprised of antioxidants that help promote optimum skin health by preventing and repairing damage caused by free radicals.